1dm’s pocket guide seems to fit this description very well; or at least its purpose would certainly go hand in hand with that design goal. Let’s examine a little closer to see what exactly 1dm has done. Were it me, I would likely cut costs on the map section: Mike’s digital maps are really not too expensive at $2, and he’s a very talented cartographer, but with tools available to easily create one’s own gorgeous maps (e.g. HexKit and Wonderdraft for larger-scale regional maps), not to mention the various tutorials for making your own maps in GIMP or Photoshop, I think that’s a cost that could easily be lowered. The BIG question, of course, is what would we do differently if we made our own DM Bible? The main thing I can see that definitely seems to be missing is: Monsters. I would like to see a few spreads on monsters; perhaps a whole color section. Random encounter tables would be a good bet; I suppose you could slip in stat blocks for some of the more common monsters native to various environment types. Or you could use tables for random creature generation like the ones in The Perilous Wilds or The Random Esoteric Creature Generator. 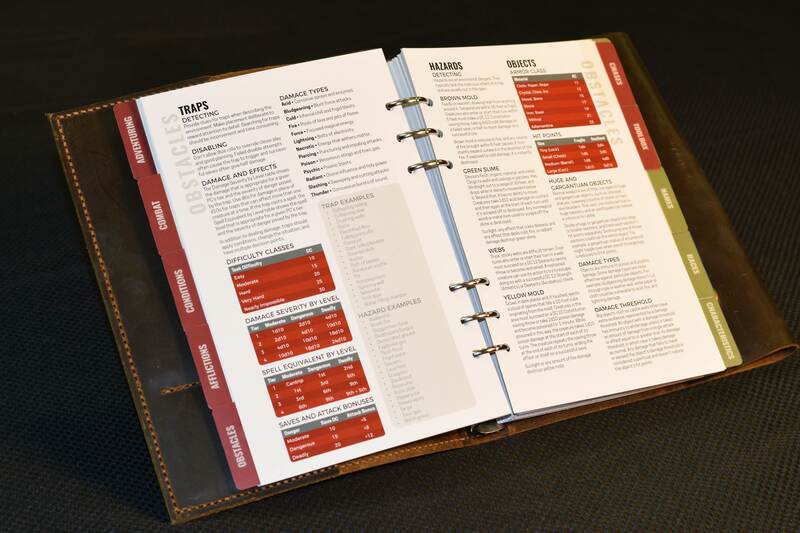 One of the advantages of using a ring’d binder and making all the pages removable is that you can easily swap them in and out if the party moves to a new location or region. Your names list isn’t appropriate anymore because the PCs are traveling extensively in the Underdark or another Plane? Have your Planar names sheet ready and you can just swap it in until they return. Same with your encounter tables, or maps. And of course, there’s no reason this needs to be Dungeons and Dragons 5e. Swap out with your favorite edition, swap in13th Age or Shadow of the Demon Lord; swap in your favorite OSR ruleset, swap out for your own D&D house rules! Swap in Apocalypse World or (name your favorite RPG here). What would it look like?